We won, we won! 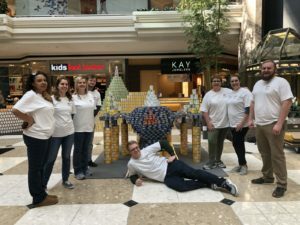 We’re so excited to share that our “Fighter Jet” CANstruction won an award for Structural Ingenuity!! We used 2,980 cans, breaking down to: 210 cans of Corn, 2,700 cans of Tuna Fish, 60 cans of Brunswick Stew, 2 Tomato Sauce, 9 cans of Tomato Paste, and 1 case of water which equaled out to be 2,312 pounds of goodness! Our fighter jet was 8’ x 8’ x 6’ tall!! Thank you to our hard working team: La’Veesha Rollins, Paige Meijer, Sara Firman—Team Captain, Austin Jefferson, Alec Kaljian, Jo Brooks, Milissa Cheves, and Joey Garland. All the food was donated to the Foodbank of Southeastern Virginia and the Eastern Shore.